Polyomaviruses of the BK- and JC-strains often remain latent within the transitional cell layer of the bladder, ureters and the renal pelvis as well as in tubular epithelial cells of the kidney. Slight changes in the immune status and/or an immunocompromised condition can lead to the (re) activation of latent polyomaviruses, especially along the transitional cell layer, resulting in the shedding of viral particles and infected cells into the urine. A morphologic sign of the (re) activation of polyomaviruses is the detection of typical intranuclear viral inclusion bearing epithelial cells, so-called “decoy cells”, in the urine. 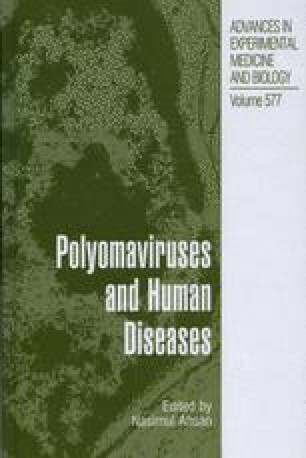 Decoy cells often contain polyoma-BK-viruses. The inclusion bearing cells are easily identified and quantifiable in routine Papanicolaou stained urine cytology specimens. With some experience, decoy cells can also be detected in the unstained urinary sediment by phase contrast microscopy. Different morphologic variants of decoy cells (types 1 through 4) are described and ancillary techniques (immunohistochemistry, electron microscopy (EM), and fluorescence-in-situ-hybridization (FISH)) for proper identification and characterization are discussed. Special emphasis is placed on the clinical significance of the detection of decoy cells as a parameter to assess the risk for disease, i.e., polyoma-BK-virus nephropathy (BKN) in kidney transplant recipients. The sensitivity and specificity of decoy cells for diagnosing BKN is 99% and 95%, respectively, the positive predictive value varies between 27% and more than 90%, and the negative predictive value is 99%. The detection of decoy cells is compared to other techniques applicable to assess the activation of polyomaviruses in the urine (polymerase chain reaction (PCR) and EM).